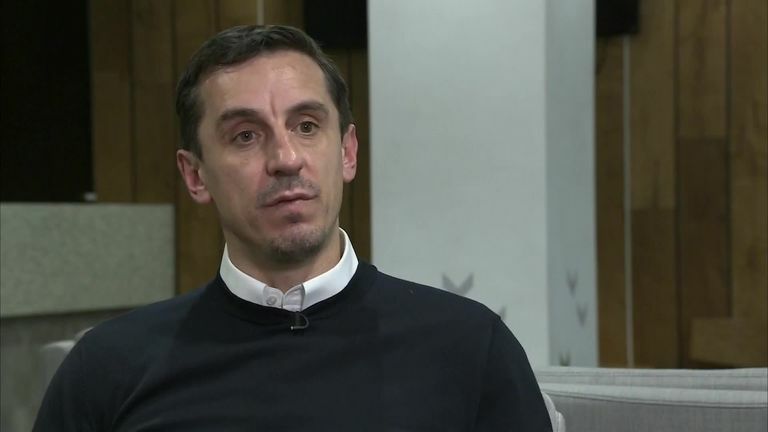 In the latest Super 6 Class of '92 Diary, Gary Neville recounts a Manchester derby where he made a mistake that had him drowning his sorrows. Although there have been some great derbies for me down the years the major one that stands out most for me, for the wrong reasons, was the one that I was captain when I made the big mistake for Shaun Goater to score. It was the first time I ever captained the club, I was subbed after 47 minutes and I just remember that night drowning in a crate of Peroni at home on my own, just absolutely depressed at how I'd played and what had happened. The best one is hard because when I was playing it wasn't really regarded as our biggest game of the season, so it wasn't really seen as the most amazing experience - it was always a game that we had to win. I had another bad experience when I got sent off for kind of head-butting Steve McManaman - there's this picture of him, Joey Barton and Robbie Fowler all around me - that's like my perfect dinner party right there! So my experiences weren't always great in derbies. I had another one playing centre half with Steve Bruce against Niall Quinn and Uwe Rosler up front and it was a really tough game, we won but it was hard work against those two physically strong players. I always found derby games tough, emotive games and the pressure was always on us as, at the time, everybody expected us to win them. It was a no-lose game for them, so it was always a massive victory whenever City would win. There are certain games like Man City and Liverpool where you know the consequences of losing are really big with them being local rivals, so they do mean a lot more. They also meant a lot to us with there being a few local lads in the teams. So locally they were big but in terms of our season overall they weren't our biggest games as we were challenging for Premier League titles and Champions Leagues and City back then weren't at that level. It was like the games were a carnival or a circus for the week but it wasn't a major festival for us. The games now have completely turned on their heads - it started a couple of years before I retired I could feel the games getting tighter and closer and City were getting better. There was one when Michael Owen and I celebrated running down the pitch to the City fans who'd been berating me all afternoon. I went down the touchline pretending to warm up doing star jumps but laughing at the same time as I knew I'd get in trouble for openly celebrating in front of them - but that's what derby games are all about. The best derby I've ever commentated on was at the Etihad Stadium when Robin van Persie scored the free kick in the last minute. I've always retained my composure on television in terms of celebrating United goals but that's the closest I've ever been to jumping out of my commentary chair. There were about 3,000 City fans sat behind me so it was probably best that I didn't. I'm really looking forward to Super Sunday - it's obviously not hard to prepare for a game with the two teams so well-known and you have an idea of how they'll play and who'll play. Gary Neville says he 'loved' Jose Mourinho's celebrations after the win over Juventus and assesses Man Utd's form ahead of the derby. People will be watching me a lot more closely due to my United connections but I think I've managed to balance it out correctly over the last few years and just comment on the game. If City are dominating and playing well then that's just the picture I have to paint and the same if United are playing well and winning - it's just putting the game into context and leaving any allegiances out of it. I think I'm a lot better now that I've got a lot more experience of commentating on these big games and it's probably the ninth or 10th derby I've co-commentated on. I haven't got a clue! Nothing would really surprise me in this game as it could swing so much either way - I wouldn't be surprised it City won 3-0 but it wouldn't surprise me if United won 2-1 or 3-2 either. My heart says United will win 2-1 because they'll basically stay in the game and score two late goals after City failed to kill them off. Big game Sunday - Salford in FA Cup action! It's a huge game on Sunday…as Salford take on Shrewsbury in the FA Cup! I can't make it to the game as I'm working on another game up in Manchester - I'm not sure Sky would have switched the Manchester derby for Shrewsbury v Salford. I'm looking forward to it though and I'll be following it. It's a free hit for us as we'll go and test ourselves against a really good team, but if we go there and get a result then we've got something fantastic to look forward to with the next round or a replay. I don't get so worked up for FA Cup games, I get more worked up for league games sometimes as I always feel like it's a game that we can just go and play in without any pressure. A lot of our lads have probably played in the first round proper before, and we wouldn't want to change our preparation from a normal game - the last thing you do as a footballer is change your usual preparation. So we'll keep things as they are and hope for a good performance.